In this short science career video James describes himself as working in science engineering, software development, clothing design and psychology. 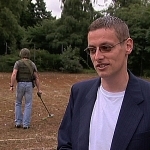 Having originally intended to go to University straight from school and then go straight into working in industry he was offered the opportunity to do a Masters Degree and then a Ph.D. at the University of Birmingham where he worked on wearable computer technology for use in forensic field archeology. During his Ph.D James also worked for a spin-off company developing embedded hardware platforms on which to base software. A combination of both projects proved to be very useful – James’ work involves both writing software and designing hardware. James says his strengths have always been in practical engineering and when James was a young boy he enjoyed taking to bits and mending broken toys. His current research is now mainly focused on human factors integration, mainly in defence. By working on military hardware James can combine the logic of computers with human intuition - for instance by attaching sensors to solders and combining with small mobile computers. Applications of this kind of research are far reaching as an aid to sending informative data between those on the ground and those in a control room and this can be applied to many services such as the police and the fire services. Future Morph - the Science Council`s website designed to provide information for young people, their parents and teachers about careers from studying science and maths. An EPRSC sponsored fun and informative site which includes details on science careers and aims to profile young scientists.